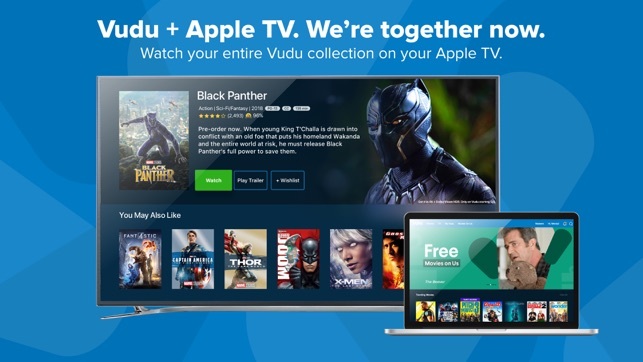 There are quite a lot of people who would like to get Vudu movies to iTunes library so that they could freely watch Vudu movies on different iOS devices (iPhone, iPad and iPod), iTunes and Apple TV. If you are looking for solutions on how to get movies from Vudu to iTunes library, this guide would be exactly where you should stop you searching. We would like to introduce you various tools on converting Vudu to iTunes. Before you try to export Vudu movies to iTunes, there are some tips you should know. Firstly, we know that Vudu is a free online movie streaming service that enables you thousands of movies and TV shows online. However, we need to know that all these streaming videos are actually Blu-ray/DVD titles. Secondly, you need to download Vudu videos firstly with some kind of Vudu video downloader apps listed below including Vudu to Go, Video Downloader, and others. To transfer Vudu movies to iTunes library, you also need to know what video formats are supported by iTunes. Video formats supported by iTunes: H.264 video, up to 1.5 Mbps, 640 by 480 pixels, 30 frames per second, Low-Complexity version of the H.264 Baseline Profile with AAC-LC audio up to 160 Kbps, 48kHz, stereo audio in .m4v, .mp4, and .mov file formats; H.264 video, up to 2.5 Mbps, 640 by 480 pixels, 30 frames per second, Baseline Profile up to Level 3.0 with AAC-LC audio up to 160 Kbps, 48kHz, stereo audio in .m4v, .mp4, and .mov file formats; MPEG-4 video, up to 2.5 Mbps, 640 by 480 pixels, 30 frames per second, Simple Profile with AAC-LC audio up to 160 Kbps, 48kHz, stereo audio in .m4v, .mp4, and .mov file formats. Therefore, you need to download and convert Vudu movies to MP4, M4V, MOV file formats for iTunes library. Then you only need to transfer the downloaded and converted Vudu videos to iTunes as you usually do. As to getting Vudu videos to iTunes, there is an app called Vudu to Go that could help you do this. Firstly you will need the latest version of Adobe Flash and Adobe AIR. With these 2 plugins installed on your computer, you could make use of the Vudu to Go app to download Vudu movies for iTunes. 1. Download and install Adobe Flash and Adobe AIR on your computer. 2. Open Vudu app and select the movie you want to download. 3. Click the “Download” option and then choose “SD”, “HD” or “HDX” option to start downloading process. 4. Then, open Vudu-to-Go app, login with your Vudu account. 5. You could then click the Download button on Vudu-to-Go app to download selected movie from your Vudu app you are watching. With Vudu-to-Go app, you could easily download Vudu movies onto your computer. Then, you could import the downloaded Vudu movies to iTunes as you usually do. 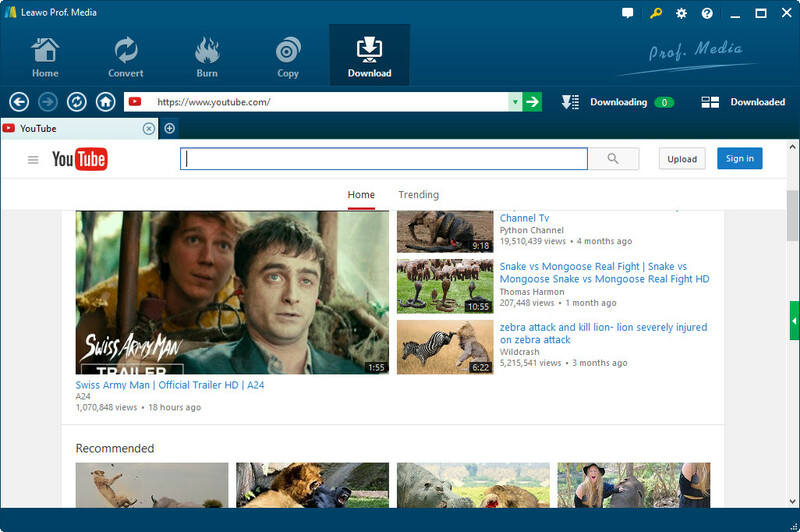 Also, to download Vudu movies on PC, you could make use of 3rd-party online streaming video downloader software tools. There are quite a lot of wonderful online video downloader tools. Leawo Video Downloader is one of the top-notch online video downloaders that could perform as a professional Vudu movie downloader to help you download Vudu movies. Leawo Video Downloader, a professional online video downloader program that could download video from 1000+ sites like youtube.com, facebook.com, vevo.com, veoh.com, etc., could perform as a perfect Vudu movie downloader to download Vudu movies without any quality loss. It provides multiple download options of target Vudu video in different resolutions, quality and formats for you to download. Download and install this video downloader program on your computer and then launch it. Follow the below steps to learn how to download Vudu movies to computer. The below steps would show you how to download video from Facebook in HD with Leawo Video Downloader. After downloading and installing Leawo Video Downloader (a module of Leawo Prof. Media), kick off Leawo Video Downloader. Click the wheel icon on the top-right corner and then navigate to the “Downloader” tab to set output directory in the “Save videos to” box. 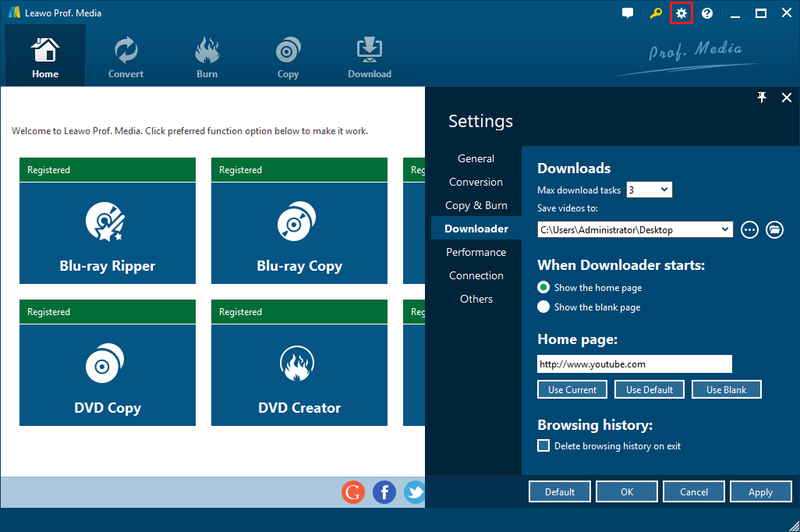 You could even set the home page of your downloader browser within Leawo Prof. Media. Open the “Download” module and then copy and paste the URL of Vudu movie you want to download into the browser address bar. Then, hit the Enter key on your keyboard to get target Vudu movie. On the right sidebar, Leawo Video Downloader would provide multiple download options in different resolutions, quality and formats. Choose the one you want to download. Note: There are audio-only files that have no video content, therefore you need to choose carefully. Then, after determining which Vudu movie to download, click the download icon next to it to start downloading Vudu movie you want. You could then view all the downloading Vudu movies on the “Downloading” tab and then open “Downloaded” tab to view all downloaded movies from Vudu or other sites. As mentioned above, iTunes only accepts video files saved in MP4, MOV and M4V formats. Now, with Vudu movies downloaded to your computer, you might have found that the downloaded Vudu movies are not saved in MP4, MOV or M4V file formats. In such case, you could make use of the Convert module built in Leawo Prof. Media. That is Leawo Video Converter, a professional video converter program that could help you convert YouTube to Apple TV, make iPhone ringtones from YouTube video, convert YouTube to MP3, etc. Actually, as a professional video and audio converter combo, it could convert video files between hundreds of video formats like FLV to MP4, MP4 to MKV, MP4 to AVI, AVI to MKV, etc. It even allows you to edit downloaded Vudu movies like adding watermark, applying 3D effect, etc. Follow the below steps to learn how to convert downloaded Vudu movies to iTunes compatible MP4, MOV, or M4V video files with Leawo Video Converter in detail. Under the “Downloaded” tab, right click downloaded Vudu movies and then choose “Add to Convert” option to add downloaded Vudu movies to Convert module. Click the button next to “Add Photo” button and then choose “Change” option to enter the Profile panel. Then, successively open “Format > Common Video” group to choose MP4 Video, MOV Video or M4V Video as output format since iTunes accepts MP4, MOV and M4V. If you need, you could even adjust the output file format parameters like video codec, bit rate, aspect ratio, frame rate, audio codec, audio bit rate, channel, sample rate, etc. To do these, just click the “Edit” button on the drop-down panel after you click the button right before the big green “Convert” button. After setting output format, click the big green “Convert” button to set output directory in the “Save to” box of the sidebar. Make sure you have selected a drive with enough space. After setting output directory, click the bottom “Convert” button to start converting downloaded Vudu movies to MP4, MOV, or M4V files. The conversion will last for a few minutes, depending on the file size and computer performance. When the conversion finishes, you have got downloaded Vudu movies in iTunes compatible MP4, MOV, or M4V file format. You could then freely import the converted Vudu movies to iTunes library. As a professional video converter software program, Leawo Video Converter performs far more than a simple video converter program. It also enables you to edit videos like adding watermark and 3D effect, adding subtitles, snapping screenshot, etc. 1. Open iTunes on your computer. 2. Click on “File > Add to Library” options consecutively. 3. Browse for the converted Vudu movie files from your computer hard drive. You could hold down Control (Windows) or Command (Mac) as you click to load and add multiple Vudu movies to iTunes library. 4. After selecting converted Vudu movies, click the “Open” button to start to importing converted Vudu movies to iTunes library. 5. Now, you have added converted Vudu movies to iTunes. You could now transfer the imported Vudu movies to iOS devices or play back imported Vudu movies within iTunes as you like. Actually, you could directly drag and drop converted Vudu movies to iTunes library for adding Vudu movies to iTunes after downloading and converting.